Get a 25% discount with a 2-year subscription from ESET. Click link to check it out. Enjoy a free 30 day trial at ESET when you click this link! 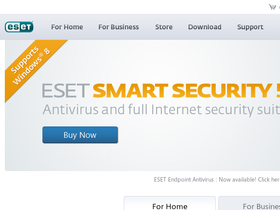 Act now to get 10% off your next purchase at Eset.com. Click link to get started. Get an extra 10% discount on NOD32 Smart Security 4 (Antivirus/Antispam/Firewall) on top of the 25% promotion with this coupon code. Click link. Head on over to ESET to save $20 on Smart Security for 2 year licenses. Click link for details.